Adrianna Franch and her mother speak at a fundraiser for Willamette West affiliate in Tigard; two local aid recipients also talk. Adrianna Franch, who goes by "AD" these days, is best known as goalkeeper for the Portland Thorns — and goalkeeper of the year in 2017, when the Thorns won the National Women's Soccer League championship. But a decade earlier, she and her mother, Raqual, were living in a house built by Habitat for Humanity in Salina, Kan., where Raqual worked at the regional health center. They recalled those times Friday, May 11, when they spoke at a fundraiser for the Willamette West affiliate of Habitat for Humanity. Raqual Franch said life was less stressful once the family had a place to call home. "It offered security. 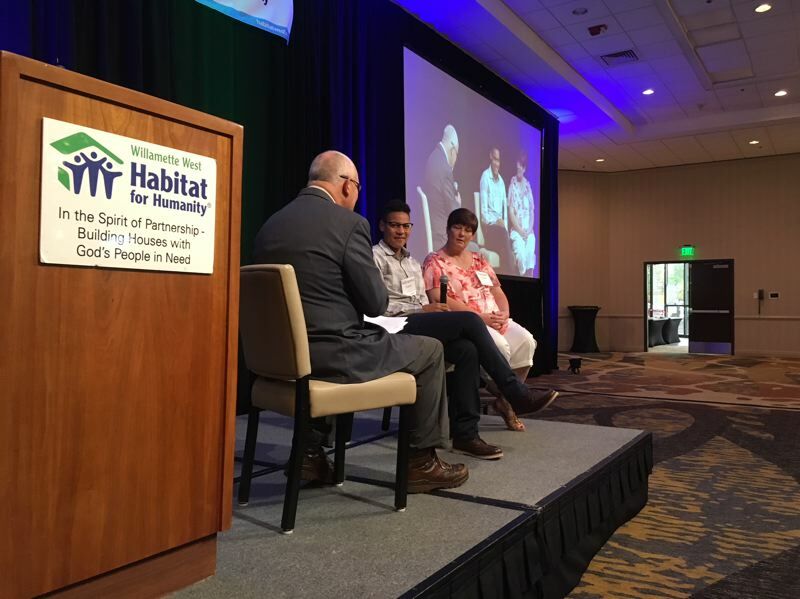 Your kids have a home — a real home they can call theirs — instead of bouncing from one apartment to another when the rent goes up," she said to about 300 people who attended the breakfast at Embassy Suites in Tigard. "They can have their own yard where they can go and play and feel safe, and a driveway where they can ride a bike. It was such a blessing." The Willamette West affiliate covers parts of Washington and Clackamas counties and is one of 32 in Oregon — four in the Portland metro area — 1,400 in the United States and a total of 2,100 worldwide. Habitat for Humanity International, based in Atlanta, does not give away homes. Applicants are screened for their ability to pay mortgages — though the mortgages are no-interest — and contribute 500 hours of "sweat equity" toward their new homes. They also undergo financial counseling, and must earn between 35 and 60 percent of the area's median household income. "I was 9 years old at the time and I doubt I really understood how many hours that actually was," AD said. She recalled only that Saturday mornings began with "eating doughnuts and nailing the house." After they moved in, however, "it allowed me to be outside playing soccer every day." Later, AD was accepted by Oklahoma State University in 2009, drafted sixth in the first round of women's soccer inaugural draft by the Western New York Flash in 2013, and played in front of her mother (and 19,000 others) a few years later. She joined the Thorns in 2015. "There was one other time I felt like that crowd — and that was when we moved into that house," she said. "So thank you." The audience also heard from two local recipients of aid. John and Carol Langsford were in danger of losing their nearly century-old home in Aloha because they could not afford the upkeep or do needed repairs themselves — and John Langsford, a veteran, had worked with machine tools all his life. "Your house is life. It keeps you warm. It keeps you dry. It keeps you safe. If keeps you together. Seeing it fall apart around you causes you to lose hope," Carol Langsford said. "For veterans, self-reliance is in their DNA. I knew John was taking it hard. We knew we needed help." They were able to get that help from a home repair program that Habitat for Humanity offers to qualifying low-income people who are older or have disabilities. "Habitat believed John and I do not need case workers, we need co-workers," Carol Langsford said. Salim Nuri spoke for his family, which two months ago moved into a three-bedroom home in the Vose neighborhood of Beaverton. It was the 100th home completed by the Willamette West affiliate since its first back in 1991. His father, Semir Nuri, came to Portland with Salim — now a junior at the School of Science & Technology in Beaverton — and his older sister Suzanne back in 2010. Nuri became a U.S. citizen in 2015 and now owns a transportation company that specializes in nonemergency medical deliveries. Salim Nuri recalled when the three of them lived in an apartment in Portland — his mother and younger sister had not yet arrived in the United States — and his father slept in the living room so that the children could share the only bedroom. "It still feels like a dream," he said. "I have my own room, there are no angry neighbors downstairs. We have our own washer and dryer. It's warm, quiet and clean. And it is ours. No more worrying about rent increases." Mark Forker has been executive director of the Willamette West affiliate for 11 years. Its office is in Hillsboro and covers Washington County except for western and southern areas. "A common misconception about Habitat is that we are a global machine, and I just send the bills to Jimmy Carter, who pays them. Not true," Forker said. Carter lent his efforts to the organization in 1984, a few years after he left the presidency. He and his wife, Rosalynn, continue to take part in an annual weeklong project of home building and repairs. Their 2018 project is scheduled in Indiana, a few months before the former president turns 94. The Willamette West affiliate just broke ground on Denney Gardens, which will result in 16 more homes in Beaverton. It also has vacant lots that will eventually accommodate 16 homes in King City and eight in Hillsboro. In 2017 the affiliate opened 10 homes and repaired 17 others to accommodate a total of 78 people. Forker said the efforts make a small dent in larger problems with housing and homelessness. "Kids are doing without food and adequate clothing. In some cases families end up homeless. We have all seen the tents and tarps along our roadsides," he said. "Clearly the need is great — and it is local." The Willamette West affiliate received 100 applications for help in 2017, and 50 were deemed qualified — but only eight families could receive aid. Jim Woodruff, a member of the affiliate board who works at Intel, said there is more to be done. "You heard from Salim and the plans their home is helping fulfill. You heard from Adrianna and Raqual, who embody the empowerment that comes from stable shelter. You heard from Carol about the joy she and John are feeling for being able to stay in their home," Woodruff said. "Yet so many more families could benefit from Habitat if we only had the funds."